This watch perfectly exemplifies the spirit of the Classique collection. Made of precious materials (18 carat red gold or 950 platinum), it comes in three different dial versions, each representing one part of the world: the Americas, the European and African continents, or Asia and Oceania – six references in all. 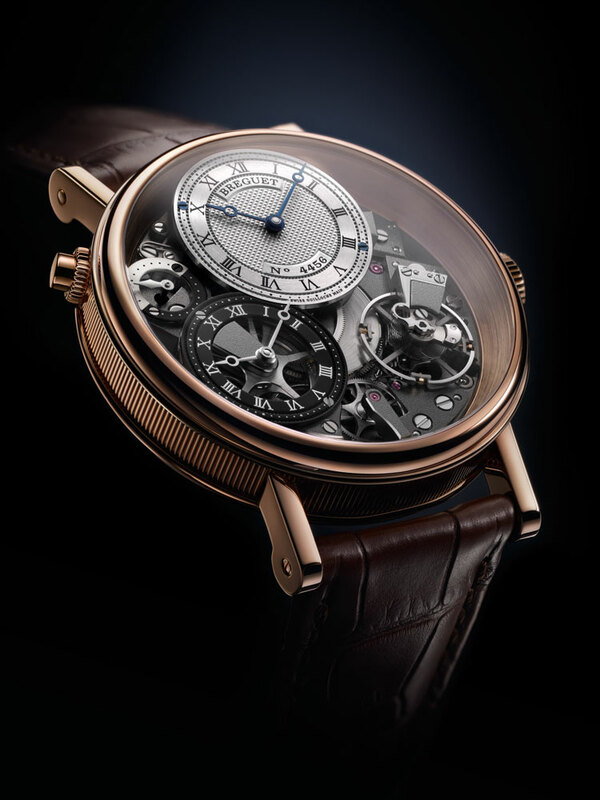 Breguet’s teams needed three years to design, develop and perfect this complication watch. It is the first example of a mechanical timepiece with an instant-jump time zone display. This function allows the traveller to easily display the time in two pre-selected time zones, changing instantly from one to the other simply by pressing a button, without disturbing the operation of the watch. Accurate operation during setting is ensured by a stop second system. Changing the time zone affects not only the time, but also the date synchronised through a “tracking” calendar system – and the day/night indicator. The watch is equipped with the 5717 self-winding mechanical movement, which is based on Calibre 777 with a silicon escapement, in this case fitted with an additional module. Four patent applications were filed when it was designed. In terms of its finishes and case, this watch, measuring 44 mm in diameter and 13.55 mm thick, is in the purest Breguet tradition. It has a sapphire caseback and a number of sophisticated touches such as a thin, rounded bezel, a case middle with fluted sides, and added soldered strap lugs. The display uses the famous Breguet hands, recognisable anywhere by the `eccentric moon tip’. The hands run over a solid gold, highly complex dial. The dial’s periphery, sporting a chapter ring with Roman numeral transfers, has a silvered and circular satin-brushed finish, a border that is hand-engraved on a rose engine, and red-gold hour markers – or platinum depending on the version of the case. It has a power reserve of 55 hours and is water resistant to 30 metres. Although Breguet’s Classique collection already includes several perpetual calendar models, this new version stands out for the way the dial display has been organised. To draw attention to the essential information, the dial has been given a third dimension by lifting the hours and minutes chapter to the foreground with the help of an offset sapphire disc. The opaque chapter ring with its metallic Roman numerals reveal the time instantly with the aid of the Breguet open-tipped hands in blued steel. Beneath the disc, an engine-turned hobnail pattern decorates the dial, overarched by the semi-circular scale of the retrograde dates. The one-minute tourbillon at 6 o’clock nicely complements the chapter ring. Despite the curve, its bridge is delicately chamfered and surmounted by a triple hand for the seconds. The sub-dial for the days at 9 o’clock is engine turned in waves. In the movement, a snail cam makes the days hand jump instantaneously. At 3 o’clock a blued steel hand points to the months on a dial engine-turned in a shimmering sunburst pattern. At its centre a blue sun shows the leap years. At the back of the watch, a sapphire-crystal glass reveals the movement and the way the baseplate has been designed to throw the maximum light onto the tourbillon. The 41 mm diameter case, in rose gold or in platinum, is finely fluted around their sides and the lugs are welded on. The engine-turned patterns, the unique number, hands in blued steel and the secret signature complete the features that identify a Breguet watch. It comes with a power reserve of 50 hours. Even though the reference 3797 watch (talked about on the previous page) can already be considered as a masterpiece, Breguet’s watchmakers chose to compound the difficulties by making an even more spectacular version: the reference 3795. The dial vanishes to make room for a skeleton version revealing all the sophistication of the movement’s construction. The Classique 3795 is authentic mechanical haute couture with its lace-like engravings on the bridges, a well-rehearsed display of Breguet’s delicate workmanship and experience. 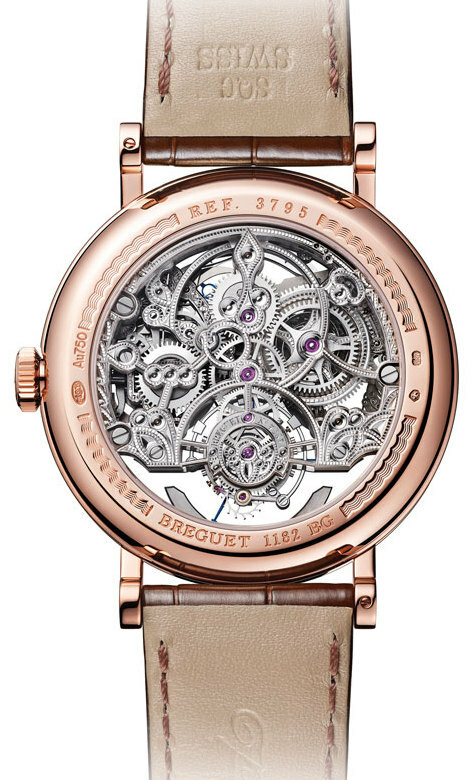 Like in the case of reference 3797, 3795 also has all the identifying attributes of a Breguet timepiece. The 41 mm diameter case, in rose gold or in platinum, is finely fluted around their sides and the lugs are welded on. The engine-turned patterns, the unique number, hands in blued steel and the secret signature complete the features that identify a Breguet watch. It is water resistant to 30 metres. 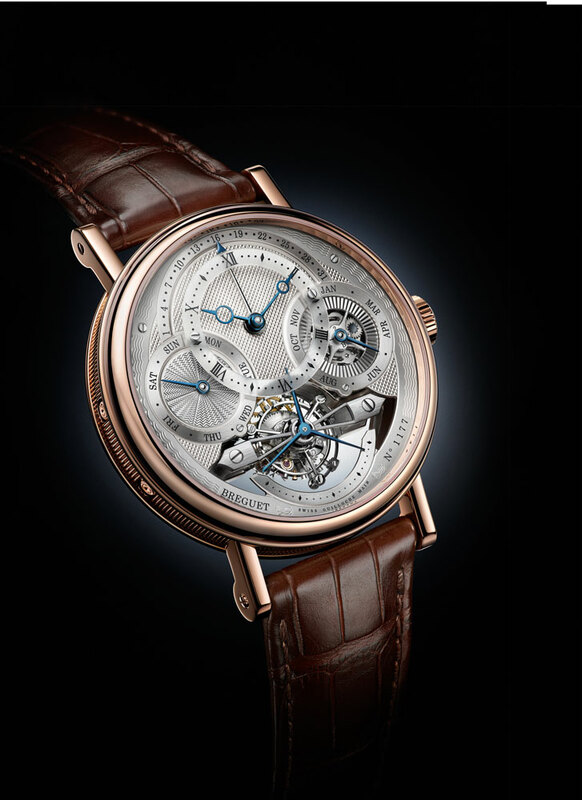 This watch is the timezone version of the famous Breguet’s 7027 Tradition from 2005, the first of its wristwatches to reveal the mechanisms of the movement on the dial side of the baseplate. The stylistic elegance of the 7067 version is commensurate with its ease of operation: a button on the caseband at 10 o’clock quickly sets the timezone, which can be seen on an off-centre dial at 12 o’clock. A second engine-turned dial at 8 o’clock shows the reference time with its day/night indicator, alternating between silver and black at 10 o’clock. Despite its additional function, this timepiece remains true to the identity of the collection with its anthracite-coloured movement highlighting the balance-wheel at 4 o’clock. The Breguet spring with its raised terminal curve and the inverted inline lever escapement are both in silicon and ensure the outstanding stability of rate born of Breguet’s technical inventiveness. The manually wound movement with a power reserve of 50 hours is fitted into a 40 mm diameter case in rose or white gold. As in the first Tradition model, the power reserve indicator can be seen at the back of the watch through the sapphire-crystal caseback that also reveals a part of the movement that is generally hidden. Blending both hindsight and foresight, the Tradition GMT 7067 displays all the attributes of a Breguet watch: the delicately fluted caseband, the Breguet hands with a moon cut into their tips, welded lugs and an engine-turned dial with a secret signature and an individual number.